It’s amazing on how many levels this is a bad cartoon, several of which spill over into being actually offensive. The editor should have sent it back with multiple revisions requested, and ideally it should have been spiked completely. Whenever I see political and satirical cartoons I am always bearing in mind something Martin Rowson of The Guardian said in a talk I saw five years ago. Commenting on the recent controversy surrounding the Danish cartoons of Mohammed, Rowson said he felt it was the cartoonist’s job to attack those worthy of attack, and that these were the people in power, the people more powerful than the cartoonist. In the case of the Mohammed cartoons this hadn’t happened – as Mohammed is dead it wasn’t him (a powerful religious and military figure) being attacked but followers of his religion, ordinary Muslims who would be in a position of less power than the cartoonists were. Drawing George W Bush as a chimp, as Steve Bell is wont to do, is fine because Bush is a powerful man, but ordinary people with no recourse to reply are not. And so to the Times cartoon. Obviously it is not a direct attack on the Somali people themselves, but look at the depicted children. Each identical in appearance, and looking like caricatures at that. There are almost overtones of ‘all foreigners look the same’. It doesn’t take much to make people look different in cartoons, and it doesn’t take much to make the people you are drawing look like, oh I don’t know, actual humans. Then there’s the comparison of the famine with the phone-hacking case. Obviously both are serious. Endemic corruption in a country’s government, press and police can’t be easily dismissed as trivia and fluff despite the efforts of some, mostly journalists associated with News International and its outlets. I am not going to argue, however, that it is more serious than the famine because, quite simply, it isn’t. On the surface this makes the cartoon’s heavy-handed and poorly drawn sentiment agreeable. The BBC’s Africa correspondent Andrew Harding says the emotive word “famine” is used rarely and carefully by humanitarian organisations, and it is the first time since 1992 that the word has been applied to a situation in Somalia. The situation in east Africa hasn’t suddenly crept up on us. The Today program was reporting on the imminent announcement of famine a week before it was official, and the crisis itself has been developing for years in a country with no proper government and with militias keeping international aid efforts out. Yes, the media has been awash with the phone-hacking scandal over these last few weeks, but can it be argued that it’s not a hugely important event? It’s certainly more important and more significant than the Royal wedding or Cheryl Cole’s ongoing problems with X Factor USA/Ashley Cole/breaking a nail. A truly honest cartoon would take this into account, and a truly attentive cartoonist would have highlighted the Somalia situation earlier. As it is it just comes across as a News International employee trying to divert attention from the serious wrongdoings of their bosses. Anyway, if you only click on one link from this post, make it this one: https://www.donate.bt.com/DEC/dec_form_eaca.html?p_form_id=DEC01 Aid agencies may not currently be able to get into the affected areas, but they need to be prepared in case they do, or if the people in these areas can escape from the combination of environmental and human hostility. One World Week finally threw something up other than food under curtains in the Union (joke) – thank you, thank you, thank you to whoever was responsible for booking Guardian, Independent, etc etc cartoonist Dr Martin Rowson to give a talk on political cartoons and their history. It was probably the most fascinating talk I’ve heard in my time here. Sorry lecturers, but this was brilliant. Dr Rowson has a ridiculous number of plaudits and honours to his name. He’s London’s official cartoonist. He’s won cartoon of the year. And judging from the talk today he is well informed on the history of cartoons, from Hogarth, Gillray and Low, to his contemporaries like Steve Bell.The talk could easily have been three or four times as long and (numb bum from sitting on the floor aside) it wouldn’t have made a difference. It was one of the most informative hours of my life. He presented us with his philosophy and his methodolgy, albeit not in an in depth, “I use these pencils” kind of way (I admit, I asked him about those details afterwards). His philosophy was one which I felt was perfectly balanced. Whilst admitting there are contradictions to beware of, he articulated an idea (I’d hesitate to say doctrine though manifesto would fit) that in politics those who you are drawing are people who have enough presumption to want to rule our lives. Thus they are themselves legitimate targets to be satirised. Dr Rowson insisted he never picks on anyone less powerful than himself. This lead him to an interesting discussion of the Danish cartoons – he feels the cartoons themselves were wrong because they picked on people weaker than the cartoonists – poor Muslim immigrants in Denmark – but the over the top reaction distracted and derailed the debate. To his mind the protests almost justified the cartoons. Almost, but not quite. It is a fascinating perspective that many people in that debate never thought of. The position of the artist overlooked. Guess it takes an insider to see such things, and yet I was completely in agreement with him. 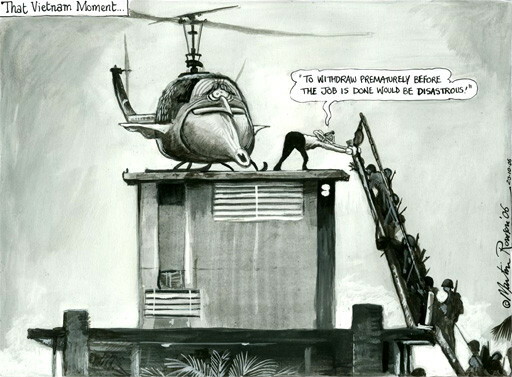 Martin Rowson on Bush in Iraq. He covered a lot of topics – a brief history of cartooning which could have been longer, and which I think he would have made longer of he’d had more time, and which got me really thinking about my course (this happens to us historians). He went into the rivalries amongst cartoonists (they steal from each other all the time which was funny). He dealt with 9/11 and Blair and Iraq. 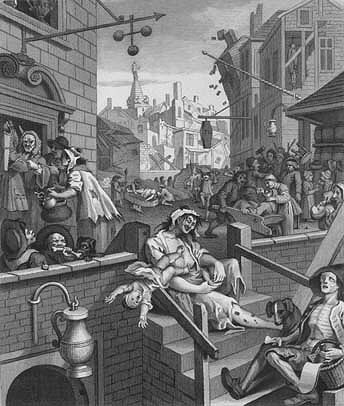 Hogarth’s ‘Gin Lane’, one of the most important cartoons of all time. Cartoons are seen as things which are meant to be funny, something which both frees and limits them. The Guardian should continue its podcast obsession and get Dr Rowson to give his talk (or a version of, it was rather visual with lots of his art and the art of those who inspired him) in a form which can be downloaded and heard further afield. I have a lot to think about now, which is nice.